Recommended for a service of up to 50 guests. Bartender comes with bartending tools. Recommended for more than 50 up to 100 guests. Recommended for more than 100 up to 150 guests. Bartenders come with bartending tools. Recommended for more than 150 up to 200 guests. *All bartenders come with basic bartending tools. Reserve our unique Tiki Bar perfect for your Luau Hawaiian, beach or pool party. Reserve our White Signature LED multi-color lighted Bar, perfect for lively upbeat events. Reserve one of our 6 ft bars with black elegant skirts. 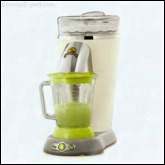 Reserve our Frozen Margarita Blender perfect for parties 50 guests or less. Margarita salt included. Rent our quiet portable generator to power up your outdoor equipment in remote areas.